Dreambaby Broadway Xtra Wide and Xtra Tall Gro-Gate with Track-It Technology is the ideal childproofing tool to protect children from danger and injury around the home. Featuring an innovative puzzle lock and one handed operation, simply lift the gate and follow it through the puzzle pathway to unlock. This hardware mounted gate will fit openings between 30 inch - 53 inch and measures 36inch tall. The gate will swing open in both directions for easy walk through with no tripping hazards. Utilizing the reversible or removable tab, the gate can be limited to swing in one direction only making it perfect for top of stair use. The unique EZY-Check Indicator helps give you peace of mind by clearly showing if the gate is locked or unlocked. When unlocked the status indicator will be red and when locked and secured properly it will turn green. Dreambaby gates add both style and safety to your childproof home. TOP OF STAIRS APPROVED: The Broadway Gate is suitable for top and bottom of stairs as well as doorways, hallways and more. ONE WAY OPENING: The gate can easily be adjusted to swing in only one direction, making it perfect for use at the top of stairs. FLEXIBLE PLACEMENT: Gro-Gates grow without the need for extensions making this gate fit openings between 30 inch - 53 inch. PARENT TESTED, PARENT APPROVED AWARD WINNER: JPMA certified, Parent Tested Parent Approved Award winner, 2016 Top Choice Award Winner, 2016 Creative Child Awards Product of the Year Award Winner. The Dreambaby Brooklyn Converta Play-Pen Gate is a versatile and convenient way to keep your child safe and provide a large, sturdy play area for them anywhere around the home. Easy to install and made from durable metal, this is a fantastic addition to any home. As a 6-panel playard and featuring soft mesh sides for easy visibility, it can be set up in a variety of shapes, remaining large enough for your little ones to enjoy free space to play around in. The clever 3-in-1 design allows the panels to be configured to: 1) create an extra-long gate, 147.5 inch wide; (panel extensions sold separately) 2) create a protective guard around a room or door; 3) create a fireplace guard. The EZY-Check indicator shows the gate is securely locked with just a quick glance and the double action locking feature helps keep even the most curious toddlers at bay. Smart Stay-Open feature is perfect for when you need to move freely through the gate, just swing the door in the stay-open position. 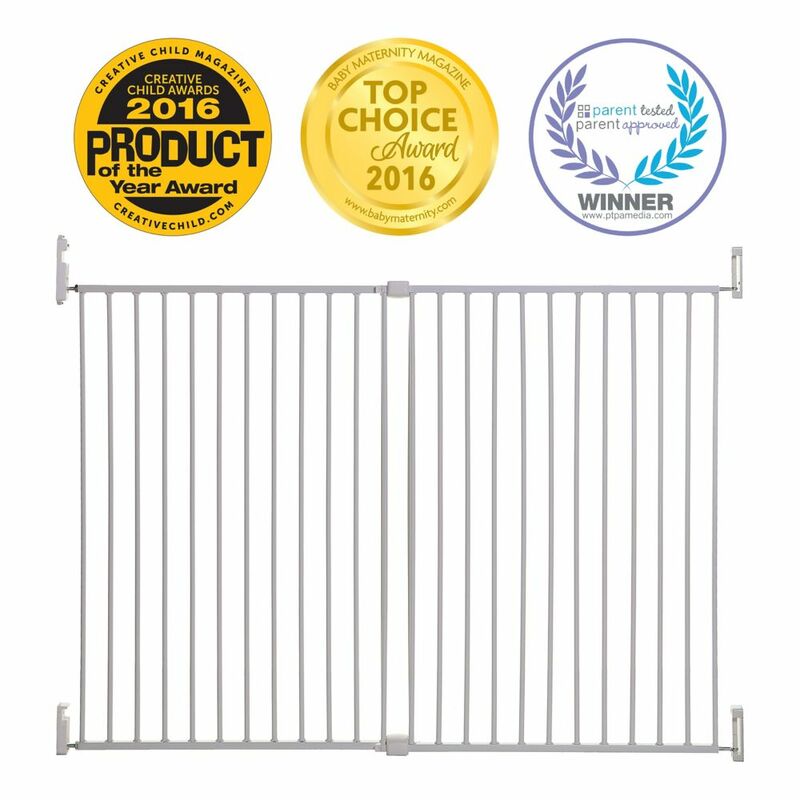 The Dreambaby Chelsea Xtra Tall Auto Close Metal Security Gate combines safety and convenience in one fantastic package. Great for every home, this pressure-mounted gate is easy to install and is perfect for temporary or rental properties with no screws or drilling required. Designed by parents, for parents, the Chelsea gate allows for one-handed operation, a door that opens in both directions and closes automatically from any distance, every time. For added security, the EZY-Check indicator shows the gate is securely locked with just a quick glance and the double action locking feature helps keep even the most curious toddlers at bay. Smart Stay-Open feature is perfect for when you need to move freely through the gate, such as when you're carrying groceries or clearing the table. Just swing the door in the stay-open position and it will stay wide open until you choose to close it. The Dreambaby Mayfair 3-in-1 Converta Play-Pen Gate is a versatile and convenient way to keep your child safe and provide a large, sturdy play area for them anywhere around the home. Easy to install and made from durable metal, this is a fantastic addition to any home. As a 6-panel playard, it can be set up in a variety of shapes, remaining large enough for your little ones to enjoy free space to play around in. The clever 3-in-1 design allows the panels to be configured to: 1) create an extra-long gate, 147.5inch wide and 29inch tall; (1 x 22.75inch panel extension sold separately) 2) create a protective guard around a room or door; 3) create a fireplace guard. For added security, the EZY-Check indicator shows the gate is securely locked. Smart Stay-Open feature is perfect for when you need to move freely through the gate, such as when you're carrying groceries or clearing the table. Just swing the door in the stay-open position and it will stay wide open until you choose to close it. The RailBlazers. Aluminum Railing system is designed with an emphasis on style, durability, and quality. Our patented railing system is engineered to be safe, DIY-friendly and easy to install. Made from powder-coated aluminum for low maintenance and lasting performance. Customize with standard or wide aluminum pickets, glass panels, decorative spacers, and more! Available in black and white. Get beautiful, PRO quality results for any deck, patio, or balcony.The Picket Gate comes with everything you need to install a fully functional gate (fasteners, hinges and latch assembly). This gate is perfect for a classic and stylish look. The maximum gate opening is 46 inches and the removable posts allow the gate to be adjusted to fit narrower openings for your custom project. Step-by-step installation guides, videos and other resources are available to guide you through your installation. For use with: End Posts, and Stair Posts. Broadway Xtra-Wide & Xtra-Tall Gro-Gate - White Dreambaby Broadway Xtra Wide and Xtra Tall Gro-Gate with Track-It Technology is the ideal childproofing tool to protect children from danger and injury around the home. Featuring an innovative puzzle lock and one handed operation, simply lift the gate and follow it through the puzzle pathway to unlock. This hardware mounted gate will fit openings between 30 inch - 53 inch and measures 36inch tall. The gate will swing open in both directions for easy walk through with no tripping hazards. Utilizing the reversible or removable tab, the gate can be limited to swing in one direction only making it perfect for top of stair use. The unique EZY-Check Indicator helps give you peace of mind by clearly showing if the gate is locked or unlocked. When unlocked the status indicator will be red and when locked and secured properly it will turn green. Dreambaby gates add both style and safety to your childproof home.